Happy Friday Eve! I’m celebrating with a post-workout glass of wine after another loooong day of work stress and cruddy weather. It’s been a nice evening here relaxing inside by the fireplace while it stormed outside and playing with a little guy that was very happy to have me home. 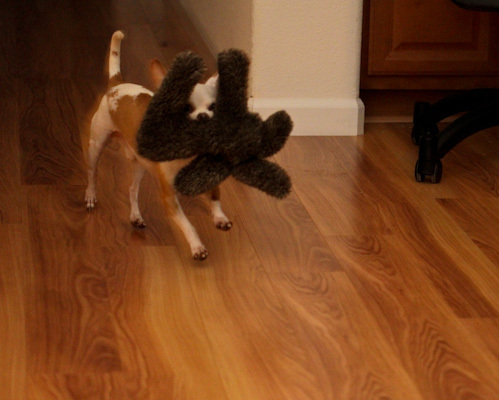 He still absolutely adores his new moose toy following us all over the house with it in case we wanted to play fetch. How could I resist? 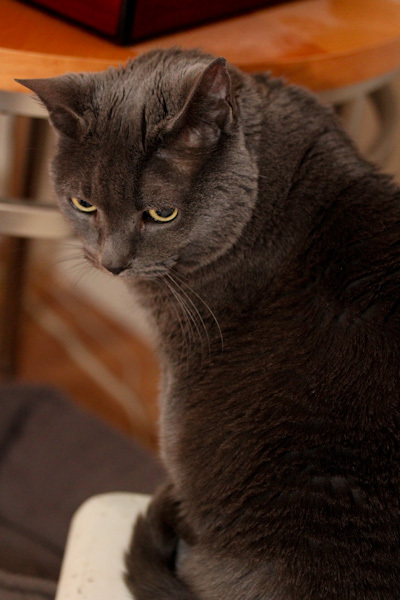 Smokey seemed less impressed with the action perfectly content to watch the fireplace instead, her favorite show. 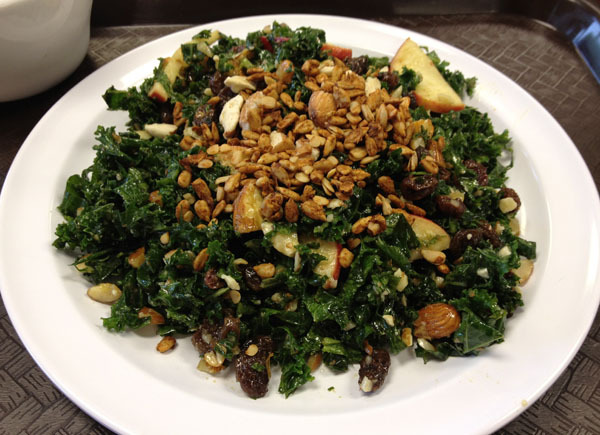 I had a wonderful lunch with hubby today at Baagan of a massaged kale salad with spicy sunflower seeds, raisins, apples, and almonds. 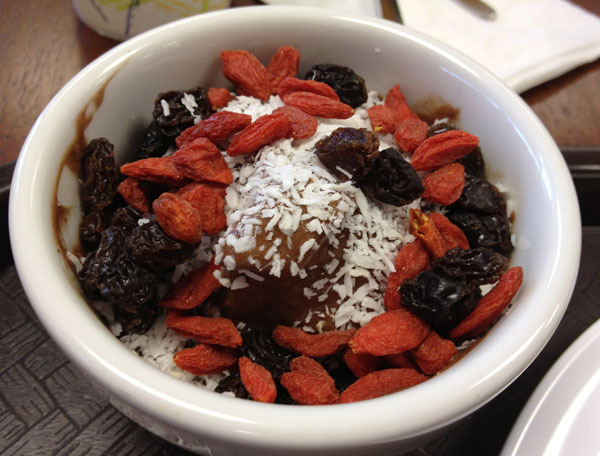 Then indulged in a little chocolate banana soft serve topped with goji berries, coconut, and raisins for dessert which hit the spot for a mid day break from work madness. After work I was in the mood to juice as I keep up with my goal of juicing 3-4 times a week. 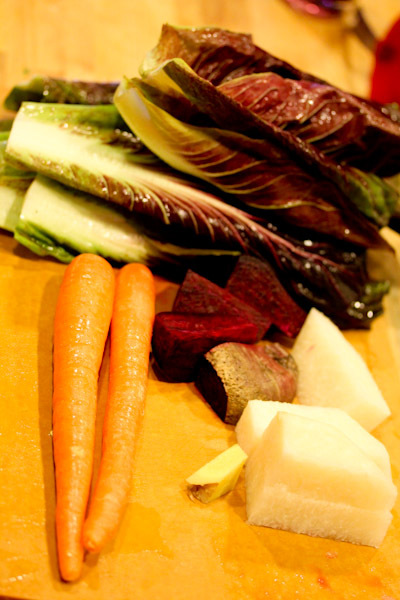 Tonight’s creation was a few radicchio leaves, carrots, a beet, jicama chunks, and a small chunk of ginger. And this was a fantastic combo! 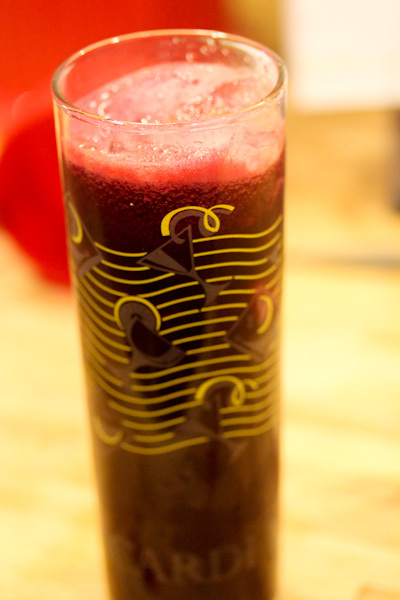 The slight sweetness from the jicama and carrots countered the strong beet flavor and bitterness from the radicchio nicely while the ginger added nice flavor. I’m getting better at juicing, this batch only took about 10 minutes to create which included chopping the veggies and cleaning the juicer – not bad! It’s reassuring that I can add more juicing to my busy work schedule lately. 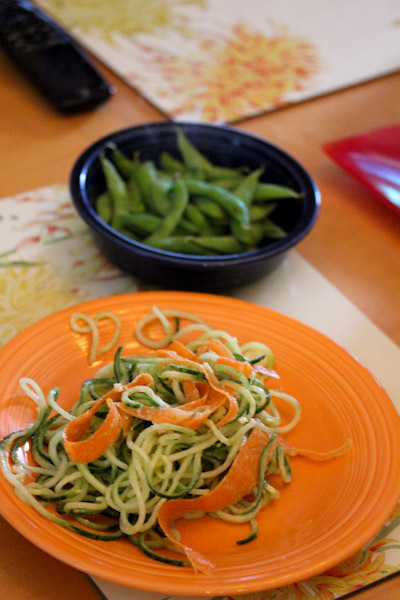 Dinner was a little more simple and lazy, I started with spiral slicing a cucumber. And it turns out cucumbers spiral slice very well with the exception of being more watery than zucchinis, but that’s okay for a moist salad. I mixed the cucumber with chopped jicama and carrot ribbons and dressed my salad with this fantastic Lemon Tahini Dressing. Paired with edamame, it was a very filling, but light meal following the juice. The dressing is amazing, very tangy, savory, silky, and creamy enough to coat veggies evenly. If you’re a fan of hummus and tahini, give this dressing a try! hope you have a great friday christine! 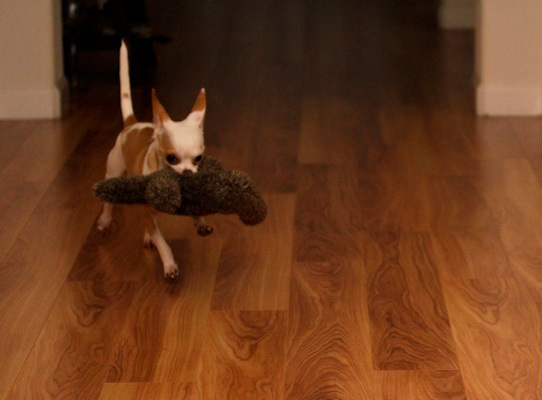 i love all the doggie and ktty pics. don’t they just make your day-pepsi always makes me forget about a bad day. oh and wine helps! 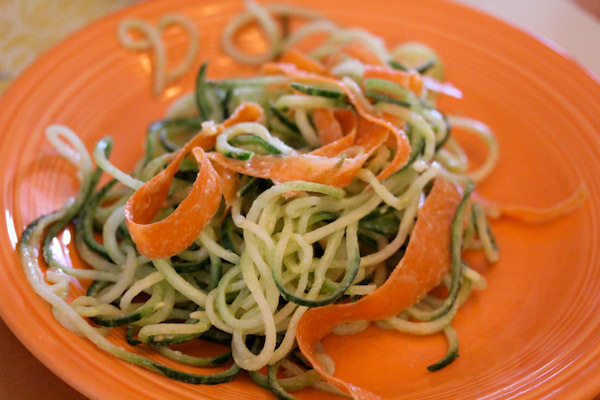 I need to break out my spiralizer– it’s been sitting in the cabinet for way too long! What’s your thinking “whole juicing” in the vitamix vs. normal juicing in the regular juicer? I do both currently usually having smoothies for breakfast and juicing a few times a week. Smoothies are more filling and can be considered a complete meal, but more work on the digestive system and the fiber in them can prevent some of the nutrients from being absorbed. Juicing is a super source of nutrients that’s easier to digest, but not a filling meal or snack. 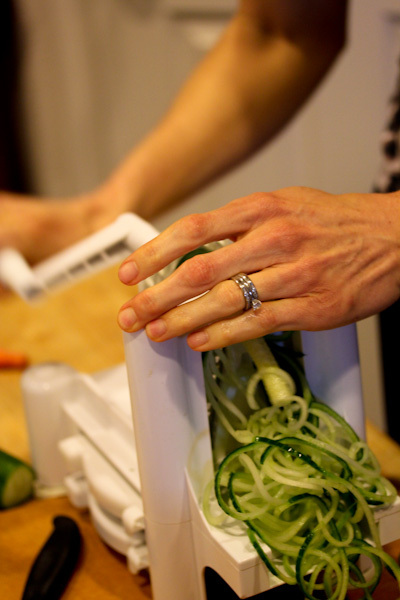 this has my name all over it and to think I never thought to try cucumbers-great idea!